The idea of intensification of an existing retail site through mixed-use is gaining tracking in Canada at an impressive rate. Ottawa and Toronto have both received, and are at various stages in the approval process, for several major redevelopment plans. Below is a collection of some of these plans. All the examples below are projects at existing shopping centre sites that are looking to intensify their project by incorporating both office and residential space. While they are too early to know if the project will be condo or rental apartments, each of these sites are an ideal candidate for purpose-built rental apartment buildings in our opinion. The proposal includes two mixed-use towers of 28 and 33 storeys which would bring 760 residential units and 4,881 m² of commercial space to the south side of the site. On the north side of the mall, a single 19-storey tower and two 6-storey mid-rises would add another 372 residential units to the site, and be joined by an 8,796 m² addition to the existing mall. These mid-rise buildings would offer ground-floor retail fronting out onto a retail promenade, a pedestrian-focused space that reconnects the modern mall with its roots as an open-air shopping centre. In total the redevelopment will add over 1,000 residential units. 3 redevelopment options have been submitted. Option 1: 7 residential buildings with 160,271 m² and 1,496 units, 11,891 m² of hotel space containing 240 rooms. 57,189 m² of new office space. Option 2: 197,004 m² of new office space, 118,485 m² of residential space consisting of 738 units, and 10,108 m² of hotel space containing 208 rooms. Option 3: 170,527 m² of office space, 101,930 m² of residential space consisting of 962 units, and a northerly expansion of the mall’s footprint. Within the site are proposed seven distinct blocks which would be occupied by thirteen buildings. Sizes of the proposed buildings vary from shared podiums which range from 2 to 7 storeys, while residential towers ranging from 10 storeys upwards to 42 storeys and 472 feet tall. A total of 3,416 residential units are proposed throughout the residential buildings, while 3,280 vehicle parking spaces and 3,849 bicycle parking spaces are proposed to be in the underground parking levels. The residential unit overview includes 331 bachelor units, 1,999 1-bedroom units, 932 2-bedroom units, and 174 3-or-more bedroom units. The development could include a combination of rental, affordable, and market-rate housing. 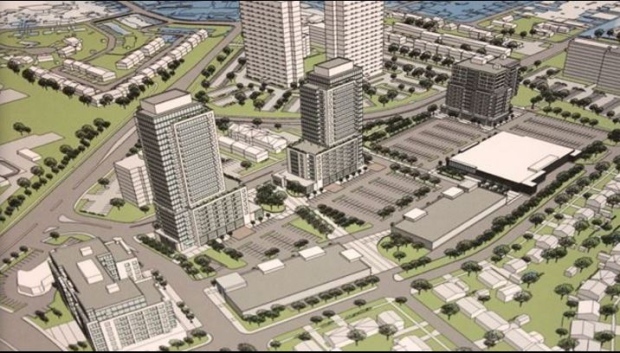 The project would see the Eglinton Square Mall remain untouched, while the majority of the surrounding surface parking lot would be divided into five separate development blocks. This would facilitate the construction of five mixed-use towers ranging in height from 25 to 40 storeys, along with stacked townhouse rows totalling 3 storeys each.The residential units are composed of 852 1-Bedroom units, 629 2-Bedroom units, and 159 3-or-more-Bedroom units, with a variety of housing types available (affordable housing, rental, or ownership). With a total of 1640 residential units. A total of 11 buildings ranging in height from one to 32 storeys are proposed. The project’s total 273,428 m² GFA is composed of 242,799 m² (89%) of residential space, 25, 127 m² (9%) of retail, and 5,502 m² (2%) of office space. While a total of 2,500 residential units are planned, the type of tenancy has not yet been determined; the planning rationale notes that a mix of any or all of market-rate condominium, market-rate rental, affordable rental, affordable ownership, and senior housing is being considered. Prev:How long will the process take to complete a apartment sale transaction?